Montreal received another challenge from the MHA's Winnipeg Victorias. This time, it was decided that they would play a two-game total goals series in February 1899. The first game was won by Montreal 2–1. Winnipeg's captain Dan Bain injured his eye and did not play in the second game due to hemorrhaging behind the eye. The second game ended in controversy. With Montreal leading the game 3–2 with about 12 minutes left in the game, Montreal's Bob Macdougall violently slashed Winnipeg's Tony Gingras. As Gingras was carried off the ice, referee Bill Findlay only called Macdougall for a two minute minor. Angry that he should have been accessed a larger penalty, Winnipeg went into their dressing room in protest. Insulted, Findlay abruptly went home, but returned after officials followed him on a sleigh and persuaded him to return. Once back at the rink, the referee gave Winnipeg 15 minutes to return to the ice themselves. They refused and thus Findlay disqualified the team and declared Montreal the winners. 4,000 were attending the Winnipeg Auditorium rink to hear returns of the game by telegraph. The Amateur Hockey Association had disbanded prior to the start of the season with the new Canadian Amateur Hockey League taking its place as the top hockey league the country. The five former AHA franchises now comprised the new league. Once again the Montreal Victorias proved supreme. 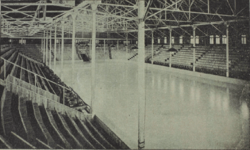 With a record crowd of over 7,000 people at the championship game, the Victorias defended their Cup title as they defeated Winnipeg in back-to-back games. The Victorias are not often mentioned in this regard, but they were unboubtably hockey's first dynasty.